Real Escapes Properties is proud to offer this highly suitable one-level home, which holds two bedrooms and two bathrooms. The "Beach House" is located in the ever popular, yet ever changing neighborhood of East Beach. 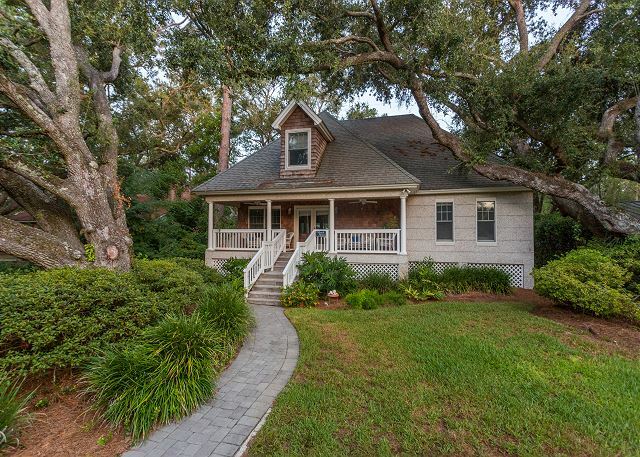 This classic island cottage rests in the heart of the neighborhood, placing you only 1/4 of a mile from St. Simons Island's best beaches. The home is also walking distance to Gould's Inlet as well as The Coast Guard Station's Public Beach Access. We're a corporate couple who enjoy relaxation without crowds especially on St. Simons Island. The Beach House is a perfect getaway where we can call it our 'home' when we're away from our real home in northeast Florida. Great vacation getaway in a spotlessly clean house, about 2 blocks from the beach! Great winter escape. A quite and restful time away. The house had all we needed. We look forward to going back and enjoying the front porch. We stayed at the Beach House for 3 weeks. It was perfect for us. The house itself was comfortable and well layed out. The porches were our favorite. It is well located. We enjoyed its proximity to the marsh, the inlet and the Beach. Real Escapes always delivers for us. This home was beautiful, clean and equipped to our family. The staff at RE listen and provide. We have a special request and they always deliver...highly recommend. We love this house! Its the perfect size for our family of 5! Lots of light, love the front porch and the location. We used the beach chairs and coolers they had. My hubby and I have stayed here several times, and we highly recommend it and the management company. The only negative is the furniture in the living area, which is 1970's style and not very comfortable at all--that's why I gave it 3 stars instead of 5. Otherwise, the house is well stocked and an especially nice feature besides the open living space is the front porch. We've always had excellent service with Real Escapes and any slight problem has been immediately addressed, which is not always typical of some of the other rental agencies on St. Simon's. House was clean and as it should be. It was our second stay here and was enjoyable. This is the 2nd time we've stayed at this house, which reflects our satisfaction with how the house is maintained and especially its location on East Beach--very easy to walk to the beach. It's well stocked for a rental, very clean, comfortable, and airy. If you don't have needs for a larger house (only 2 bedrooms), it's an excellent rental. Front porch is delightful place to hang out. Beach House is Simply Perfect! I enjoyed my stay at the Beach House and felt right at home! Perfect get away with the beach just a short walk away. Great Stay and loved the location. Will stay again. Excellent. Will be returning next year. We had the house for a week, and found it to be a terrific property - great East Beach location, very nicely decorated and clean - would definitely stay there again! We have stayed at this house on prior vacations and love the house as well as the location. I say "almost perfect" because we have more people wanting to vacation with us and may be needing a larger place. I wonder if the owners would add some rooms for us? Renting was easy. They worked with us to allow a two night rental with an additional cleaning fee and then worked with us again when we decided to stay a third night by just paying the difference between the cleaning fee and another night's rent. The staff was friendly and helpful. The place was in a great location with easy access to the beach. There was not a remote with the DVD player. MGT sent someone out with a universal remote. Could not use DVD player. We bought one and brought it home with us. Overall, it was a good house and we will be back!! and strolls on the beach serene! Great house in a wonderful location. All the major needs are more than covered. The only things lacking are wireless internet - everyone travels with a laptop and taking turns on a wired hook up is very inconvenient, and the kitchen could use some updating on pots, pans & glassware. Other than those 2 things we really enjoyed this house. Disappointed the bike wasn't there but great house. We would highly recommend The Beach House in St. Simons Island. The location was in a nice, quiet neighborhood. The house was comfortable, clean, and perfect for our use. We even used the bicycles that were on the back porch to tour the island. Enjoy your stay! Somewhat disappointed in the beach access. This was out first trip to St. Simons in many years and I did not remember that the beach access was so difficult. Would have liked to move the house we were in closer to the beach. We had a great time escaping to the beach house for a long weekend! It was so relaxing. We really enjoyed all the little extras (board games, beach equipment, towels etc.). It was nice not to have to bring our own beach toys and chairs. We played monopoly on the back porch in the evenings and enjoyed cooking in the kitchen. The beds were extremely comfortable. We will be back! Thank you! My grandaughter and her friends were thrilled with the cottage, the price and the location. Thanks, Jan!